2007 National League All-Star Final Vote winner Chris Young warming up in the Wrigley Field bullpen. All-Star Final Vote is an annual Internet and text message ballot by Major League Baseball fans to elect the final player for each team that participates in the Major League Baseball All-Star Game after all other selections have been made and announced on national television. The first 33 players are selected by a combination of procedures. The sponsorship changes annually, but the contest remains similar from year to year. Each league presents a 5-man ballot and gives the fans a few days to choose one final All-Star. The All-Star Game managers selected the entire lineups from 1933 to 1946. In 1947, the fans were given the ability to select the starting lineups. This continued until 1957, when Cincinnati Reds fans stuffed the ballot box and selected seven Reds and Stan Musial. This forced Baseball Commissioner Ford Frick to step in and replace Wally Post and Gus Bell with Willie Mays and Hank Aaron that season and to turn over the starting lineup selection to players, coaches and managers for several subsequent seasons. Since 1970, the fans have elected the starting lineup of one player for each baseball position (except the pitcher) for both the National League and American League teams. In 2003, the major league players began electing a reserve for each position as well as five starters and three relievers, although the All-Star game managers performed this duty once. Now, the "Player ballot" includes coaches, managers and players across both leagues who participate in choosing eight reserves and eight pitchers for each All-Star team. Now, the managers only select the starting pitcher from among those pitchers already elected by the players. The managers also select the remainder of the roster spots except for the final spot while ensuring that each team has at least one representative. The All-Star game manager, guided by the baseball commissioner's office, then selects a list of five nominees for the fans to choose from for the remaining roster spot for each league's team. On the Sunday evening nine days before the scheduled All-Star game, the rosters are announced and the All-Star Final Vote nominees are announced on a nationally broadcast show. The voting commences after the announcement of the nominees toward the end of the show, and continues for a prescribed number of days. Generally, a single daily update of the ballot standings is released during the voting. After voting concludes, the top vote-getter for each league is announced. Over the course of the seven years of the voting, over 100 million votes have been cast. 2002 American League All-Star Final Vote winner Johnny Damon was the first American League winner. The first All-Star Final Vote was held during the 2002 season. The 2002 Major League Baseball All-Star Game had 30 player rosters so the fans were voting for the 30th player. The 2003 Major League Baseball All-Star Game rosters expanded to 32 following the 11-inning 2002 game. As a result, the fans elected the 32nd player. In 2009, the rosters again expanded to 33, including 13 pitchers, following the 15-inning 2008 Major League Baseball All-Star Game. In 2003, the first corporate sponsor got involved in the ballot. Over the years, the sponsor has changed and the name of the fan voting procedure has changed both with the changing sponsors and the number of roster spots. As of 2017[update], every franchise except the Seattle Mariners have had at least one nominee. As of 2017[update], the Chicago White Sox have had four winners, while the Boston Red Sox and Philadelphia Phillies have each had three winners. As of 2017[update], the Chicago White Sox have had eleven nominees, most in the American League. The Washington Nationals have had eight, most in the National League. As of 2017[update], Billy Wagner is the only three-time nominee. Shane Victorino is the only two-time winner.As of 2017[update], no second baseman, shortstop, or designated hitter has been elected. As of 2017[update], many All-Star Final Vote winners have played, but only one (Evan Longoria) has recorded an extra base hit or a run batted in. Chris Young became the first All-Star Final Vote winner to be involved in the decision as the losing pitcher of the 2007 All-Star Game. Johnny Damon was the first to record a hit or score a run. All charts include seasons (including the current one at the time of the voting) in which the player has appeared in a Major League game for years of experience. Below are some additional abbreviations used throughout. All-star game experience is based on the time of the final ballot nominations (before voting). 2002 National League All-Star Final Vote winner Andruw Jones was the first National League winner. In 2002, the All-Star game rosters had 30 positions on each team so the fan voting was for the thirtieth roster spot. As a result, the official name of the contest was "The All-Star 30th Man". The voting lasted only two days and was held exclusively online through each of the 30 teams' official websites and ESPN.com. The voting for the July 9, 2002 Major League Baseball All-Star Game Final Vote started on June 30 and concluded on with the announcement of the results on July 2, 2002. Both winners, Johnny Damon and Andruw Jones played center field and recorded 3 official All-Star game at bats. 2003 American League All-Star Final Vote winner Jason Varitek gave the Boston Red Sox the first back-to-back All-Star Final Vote winners. In 2003 the final vote had a named sponsor and the rosters expanded to 32 positions. In 2003, ballot substitution was instituted. On Monday July 7, 2003, Kenny Lofton was added to the ballot to replace the Chicago Cubs' Corey Patterson who was injured on the day before. The voting for the July 15, 2003 Major League Baseball All-Star Game Final Vote was extended to three days beginning Sunday, July 6, 2003 at 8 PM Eastern Time and ending on Wednesday, July 9, 2003 at 6 pm Eastern Time. Although the leading vote totals (Geoff Jenkins – 2,872,200, Jason Varitek – 3,210,509 of a total 10.8 million) were released in 2003 individual results were not released for all contestants. In fact, the American League did not even release the final ordinal vote ranking with the final results so only the last update ordinal vote ranking is shown below. Neither Varitek nor Jenkins played, but both Giambi and Castillo batted as well as played in the field 2003 game as substitutes. Giambi replaced Mike Sweeney. Castillo was a last-minute addition to the team. 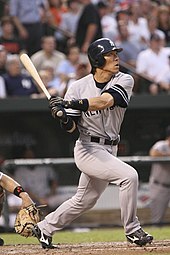 2004 American League All-Star Final Vote winner Hideki Matsui gave the All-Star Final Vote international prominence. The voting for the 2004 Major League Baseball All-Star Game Final Vote again continued for three days, running from Sunday, July 4, 2004 and ending on Wednesday, July 7, 2004. The final results were announced with ordinal vote rankings (shown below) and approximate winning vote totals (Hideki Matsui – 1.2 million, Bobby Abreu – 2 million, of more than 9.5 million votes). Abreu appeared as a pinch hitter, while Matsui both pinch hit and played left field. 2005 National League All-Star Final Vote winner Roy Oswalt is among a select few to have been nominated for the All-Star Final Vote twice. In 2005, the contest was again called the "Ameriquest All-Star Final Vote". The voting for the July 12, 2005 Major League Baseball All-Star Game Final Vote again continued for three days, running from Sunday, July 3, 2005 and ending on Wednesday, July 6, 2005. This marked the first time pitchers were nominated and the entire National League ballot was composed of pitchers. The American League ballot was composed of four outfielders and a shortstop. 2005 marked the first year that cell phone text message voting was possible. Derek Jeter and Roy Oswalt took the voting lead after Day 1. By Day 2, Scott Podsednik overtook Jeter and went on to win. Again, ordinal vote rankings (shown below) and winning vote totals (Podsednik – 3,965,473, Oswalt – 2,652,549 of 15 million votes) were revealed. Wagner was named to the 2005 team as a replacement for Pedro Martínez but did not play. Both Oswalt and Podsednik played, but Podsednik did not record an official at bat. 2006 National League All-Star Final Vote winner Nomar Garciaparra, a veteran All-Star at shortstop, won in 2006 as a first baseman. In 2006, the contest was called the "Monster All-Star Final Vote". The voting for the July 11, 2006 Major League Baseball All-Star Game Final Vote again continued for three days, running from Sunday, July 2, 2006 and ending on Wednesday, July 5, 2006. Again, only the ordinal vote rankings (shown below) and the leading vote getter totals (Nomar Garciaparra – 4 million, A. J. Pierzynski – over 3.6 million of 18.6 million votes) were announced by Major League Baseball. Liriano and Capuano were selected for the All-Star team as substitutes, but did not play. Liriano replaced José Contreras, and Capuano replaced Tom Glavine. Neither Garciaparra nor Pierzynski played. 2007 American League All-Star Final Vote winner Hideki Okajima was a rookie and first time All-Star. The 2007 "Monster All-Star Final Vote" included only pitchers (the National League included only starting pitchers). This is the 2nd time (2005) only pitchers were eligible for the final roster spot selection. The voting for the July 10, 2007 Major League Baseball All-Star Game Final Vote was the first four-day election, running from Sunday, July 1, 2007 and ending on Thursday, July 5, 2007. Voting leaders were announced daily. The ordinal vote rankings (shown below) and the leading vote getter totals (Young – over 4.5 million, Okajima – over 4.4 million of 23 million votes) were announced on the MLB.com results posting. Okajima (2–0, 0.88 ERA, & 4 saves in 38 relief appearances) and Young (8–3, 2.00 ERA, 99 K) are both first time all stars. There was some controversy surrounding Roy Oswalt's nomination because he only had a 7–5 record at the time of nominations making him the only pitcher without eight wins nominated. However, he is considered by many to be the victim of lack of run support, questionable relief pitching and an average defense. This respect was shown by the players who had voted him to sixth place among National League starting pitchers making him the first alternate in case of injury to any of the five elected All-star starting pitchers. On the final day of All-Star Final Vote voting, it was announced that Oswalt (who was running third in the All-Star Final Vote) would replace John Smoltz who withdrew from All-Star game participation due to injury. Brandon Webb of the Diamondbacks, the reigning NL Cy Young Award winner, replaced injured Colorado reliever Brian Fuentes. Neither Webb nor Oswalt played. Okajima did not play, but Young pitched 1 inning allowing a walk and a 2 run inside-the-park home run. As a result, he was the losing pitcher. The 2008 "Monster All-Star Final Vote" included no pitchers. The voting for the July 15, 2008 Major League Baseball All-Star Game Final Vote began Sunday, July 6, 2008 and ended on Thursday, July 10, 2008. The ordinal vote rankings (shown below) and the leading vote-getter totals (Longoria – 9 million, Hart – 8 million of 47.8 million votes) were announced on the MLB.com results posting. Longoria and Hart were both first-time all stars. Longoria drew a record nine million votes for his selection, over second-place finisher Jermaine Dye. Jason Giambi finished in third after a highly publicized "Support the 'Stache" campaign. Brian Roberts finished in fourth, followed by José Guillén. Hart accumulated eight million votes, the second highest vote total in the competition's history. Hart joined teammates outfielder Ryan Braun and pitcher Ben Sheets. Finishing in a close second was New York Mets third baseman David Wright, who eventually made the team as a replacement for injured Chicago Cubs outfielder Alfonso Soriano. Longoria was the first third baseman and second rookie to win the Final Vote. Hart's victory marked the third time that a club had a winning representative more than once; Geoff Jenkins (also from the Milwaukee Brewers) was elected in 2003. The other two clubs to have achieved this are the Red Sox (Damon, Varitek and Okajima) and the White Sox (Podsednik and Pierzynski). The 2009 "All-Star Game Sprint Final Vote" included no pitchers for the second consecutive year. The voting ran from Sunday, July 5 through Thursday, July 9. Eight of the selected players had never been an MLB All-Star. Washington Nationals shortstop Cristian Guzmán is a two-time All-Star, and Texas Rangers second baseman Ian Kinsler was an All-Star in 2008. In exchange for their sponsorship, text voting was available exclusively on Sprint capable mobile phones. The Philadelphia Phillies and Detroit Tigers encouraged businesses in Michigan and Pennsylvania to allow their workers time off on Wednesday and Thursday to vote for both Inge and Victorino who were in second place in early voting. Victorino became the fourth Hawaiian (following pitchers Ron Darling, Sid Fernandez and Charlie Hough) to be selected to the Major League All-star game. This year's ballot, which is shown below in order of finish, was influenced by advertisements, online commercials, fliers, merchandise, official endorsements from people such as 2008 Republican presidential candidate John McCain, and contemporary technology such as Twitter. 2010 Major League Baseball All-Star Game managers Joe Girardi of the American League and Charlie Manuel of the National League presented the 5-man ballots for the 2010 All-Star Game MLB.com Final Vote Sponsored by Sprint to determine the 34th player for each All-Star roster. Votto was named on 13.7 million of the 26 million ballots, followed by Zimmerman, Gonzalez and Wagner, in order. Swisher, who at the time was the most followed Twitter user, edged out Youkilis, in what was described as the closest race in the history of the All-Star Final Vote. Heath Bell was named substitute for Yovani Gallardo before the conclusion of the Final Vote and was removed from the ballot. 2011 Major League Baseball All-Star Game managers Ron Washington of the American League and Bruce Bochy of the National League presented the 5-man ballots for the 2011 All-Star Game Final Vote Sponsored by Sprint to determine the 34th player for each All-Star roster. Internet fans were able to vote at MLB.com and MLB team websites, while American and Canadian fans were also able to vote by text. Fans were encouraged to participate as campaign managers by generating votes via Twitter, Facebook and MLB.com websites for their choice. The fans elected Paul Konerko and Shane Victorino with 8.4 and 9.2 million votes of 50 million votes. Victorino was the first-two-time winner. MLB.com voters received special offers for discounts or free service. 2012 Major League Baseball All-Star Game offered the fans 5-man ballots to express their opinions in the 2012 All-Star Game Final Vote Sponsored by Firestone to determine the 34th player for each All-Star roster. Internet fans were able to vote at MLB.com and MLB team websites, while American and Canadian fans were also able to vote by text. In the final few hours, fans were allowed to vote via Twitter for the first time by using specific hashtags, but Chipper Jones' name was removed since he had been named to the All-Star game as a replacement for the injured Matt Kemp. The four hours of Twitter voting brought about 2500 votes per minute. Over 50 million votes were cast in the Final vote in total. 2013 Major League Baseball All-Star Game offered the fans 5-man ballots to express their opinions in the 2013 All-Star Game Final Vote to determine the 34th player for each All-Star roster. Internet fans were able to vote at MLB.com, MLB team websites and via by text. In the final six hours, fans were allowed to vote via Twitter. The contest saw an unusual alliance in which Toronto Blue Jays and Atlanta Braves fans supported each other's nominees. This resulted in Toronto relief pitcher Steve Delabar and Atlanta first baseman Freddie Freeman winning the voting. Both Freeman and National League runner-up Yasiel Puig surpassed the 2009 15.6 million vote record, with Freeman totalling 19.7. The overall vote total of 79.2 million votes also surpassed the 2009 record (68.6 million). ** – Was Anaheim Angels from 1997 to 2004. *** – Was Florida Marlins from 1993 to 2011. **** – Was Tampa Bay Devil Rays from 1998 to 2007. ***** – Was Montreal Expos from 1969 to 2004. ^ "Sports History: MLB All-Star Game". Hickocksports.com. July 12, 2007. Archived from the original on June 11, 2007. Retrieved July 28, 2007. ^ "Meche named All-Star for first time". Sports Radio 810 WHB. Archived from the original on September 28, 2007. Retrieved July 15, 2007. ^ "Fans still have say in All-Star festivities". MLB Advanced Media, L.P. June 29, 2007. Archived from the original on August 9, 2007. Retrieved July 28, 2007. ^ a b Newman, Mark (July 5, 2007). "Young, Okajima win Final Vote". MLB Advanced Media, L.P. Archived from the original on July 8, 2007. Retrieved July 5, 2007. ^ a b "All-Star rosters expand to 33 players | MLB.com: News". October 23, 2013. Archived from the original on October 23, 2013. Retrieved March 26, 2018. ^ a b c "2011 All-Star Game Final Vote Sponsored by Sprint: 10 Candidates, 4 Days, Millions of Online Votes". Reuters. July 3, 2011. Archived from the original on February 1, 2013. Retrieved July 11, 2011. ^ a b c Newman, Mark (July 7, 2011). "Konerko, Victorino go wire-to-wire in Final Vote". MLB.com. Retrieved July 8, 2011. ^ a b "Fans select Johnny Damon and Andruw Jones". MLB Advanced Media, L.P. July 2, 2002. Archived from the original on March 21, 2008. Retrieved July 6, 2007. ^ Mann, Dinn (June 30, 2002). "May the best 30th Man win". MLB Advanced Media, L.P. Archived from the original on March 21, 2008. Retrieved July 5, 2007. ^ "AMERICAN vs. NATIONAL". USA TODAY. July 10, 2002. Retrieved July 15, 2007. ^ Eagle, Ed (July 7, 2003). "Vote Lofton into All-Star Game". MLB Advanced Media, L.P. Archived from the original on July 10, 2009. Retrieved July 5, 2007. ^ McCalvy, Adam (July 9, 2003). "Jenkins gets the Final Vote nod". MLB Advanced Media, L.P. Archived from the original on July 10, 2009. Retrieved July 5, 2007. ^ Newman, Mark (July 9, 2003). "Final hours to determine final spot". MLB Advanced Media, L.P. Archived from the original on July 10, 2009. Retrieved July 5, 2007. ^ "National League at American League (box score)". ESPN Internet Ventures. July 15, 2003. Retrieved July 15, 2007. ^ Feinsand, Mark (July 9, 2003). "Giambi named to AL All-Star team". MLB Advanced Media, L.P. Archived from the original on July 10, 2009. Retrieved July 9, 2007. ^ Moussette, Pierre (July 13, 2003). "Castillo gets All-Star call". MLB Advanced Media, L.P. Archived from the original on July 10, 2009. Retrieved July 9, 2007. ^ Newman, Mark (July 4, 2004). "Voting's over, but fans' work isn't". MLB Advanced Media, L.P. Archived from the original on July 10, 2009. Retrieved July 5, 2007. ^ Newman, Mark (July 7, 2004). "Matsui, Abreu win Final Vote". MLB Advanced Media, L.P. Archived from the original on March 21, 2008. Retrieved July 5, 2007. ^ "American League at National League". ESPN Internet Ventures. July 13, 2004. Retrieved July 15, 2007. ^ Miller, Doug (July 3, 2005). "Fans decide in MLB.com's Final Vote". MLB Advanced Media, L.P. Retrieved July 5, 2007. ^ a b Miller, Doug (July 5, 2005). "Ring 'em up: Vote with your cell phone". MLB Advanced Media, L.P. Retrieved July 5, 2007. ^ Miller, Doug (July 6, 2005). "Podsednik, Oswalt lead Final Vote". MLB Advanced Media, L.P. Retrieved July 5, 2007. ^ Miller, Doug (July 7, 2005). "Podsednik, Oswalt win Final Vote". MLB Advanced Media, L.P. Retrieved July 5, 2007. ^ "Rollins, Wagner late additions to NL All-Star squad". MLB Advanced Media, L.P. July 7, 2005. Retrieved July 9, 2007. ^ a b "National League at American League (box score)". ESPN Internet Ventures. July 12, 2005. Retrieved July 15, 2007. ^ Newman, Mark (July 6, 2006). "Nomar, A.J. named Final Vote winners". MLB.com. Retrieved July 5, 2007. ^ a b "American League at National League (box score)". ESPN Internet Ventures. July 11, 2006. Retrieved July 15, 2007. ^ Eagle, Ed (July 10, 2006). "Liriano fills in for Contreras as All-Star". MLB Advanced Media, L.P. Retrieved July 10, 2007. ^ Sahly, John (July 9, 2006). "Capuano added to NL All-Star roster". MLB Advanced Media, L.P. Retrieved July 10, 2007. ^ Newman, Mark (July 1, 2007). "Monster All-Star Final Vote is under way". MLB Advanced Media, L.P. Archived from the original on July 4, 2007. Retrieved July 6, 2007. ^ "Okajima edges Bonderman, Halladay, others for All-Star spot". ESPN Internet Ventures. July 5, 2007. Retrieved July 6, 2007. ^ "On day Padres' Young becomes All-Star, pitcher decides to start suspension". ESPN Internet Ventures. July 5, 2007. Retrieved July 6, 2007. ^ Footer, Alyson (July 1, 2007). "Oswalt chosen for NL Final Vote". MLB Advanced Media, L.P. Archived from the original on July 5, 2007. Retrieved July 5, 2007. ^ Molony, Jim (July 5, 2007). "Oswalt replacing Smoltz as All-Star". MLB Advanced Media, L.P. Archived from the original on July 10, 2009. Retrieved July 5, 2007. ^ Schmetzer, Mark (July 7, 2007). "Webb replaces Fuentes on NL team". MLB Advanced Media, L.P. Retrieved July 8, 2007. ^ "American League at National League (box score)". ESPN Internet Ventures. July 10, 2007. Archived from the original on August 28, 2007. Retrieved July 15, 2007. ^ "MVP Ichiro hits All-Star Game's first inside-the-park homer". ESPN Internet Ventures. July 10, 2007. Retrieved July 15, 2007. ^ Newman, Mark (July 6, 2008). "Cast Final Vote, watch MLB.TV free". MLB Advanced Media, L.P. Archived from the original on July 8, 2008. Retrieved July 7, 2008. ^ "David Wright named to National League roster for 2008 All-Star Game". MLB Advanced Media, L.P. July 11, 2008. Archived from the original on July 16, 2008. Retrieved July 16, 2008. ^ Newman, Mark (July 10, 2008). "Longoria, Hart are fans' final All-Stars". MLB.com. MLB Advanced Media, L.P. Archived from the original on July 13, 2008. Retrieved July 11, 2008. ^ "2009 All-Star Game Sprint Final Vote Available Only on MLB.com". StreetInsider.com. July 5, 2009. Retrieved August 2, 2009. ^ Newman, Mark (July 9, 2009). "'Bran-Torino' takes a ride to All-Star Game: Inge, Victorino win epic contest in Sprint Final Vote". MLB.com. Retrieved August 2, 2009. ^ "Postseason feel to All-Star Final Vote: Several members of potential playoff clubs dot ballot". MLB.com. July 4, 2010. Archived from the original on July 8, 2010. Retrieved July 8, 2010. ^ a b "Swisher, Votto win tight Final Vote". MLB.com. July 9, 2010. Archived from the original on July 11, 2010. Retrieved July 13, 2010. ^ Dodd, Mike (July 7, 2011). "Paul Konerko, Shane Victorino win Final Vote for All-Star Game berths". USA Today. Retrieved July 8, 2011. ^ "2012 All-Star Game Final Vote Sponsored by Firestone now under way". MLB.com. July 1, 2012. Retrieved July 7, 2012. ^ "Stage is set: Twitter voting to count during final four hours of All-Star Game MLB.com Final Vote sponsored by Firestone". MLB.com. July 5, 2012. Retrieved July 7, 2012. ^ Newman, Mark (July 5, 2012). "Darvish and Freese win, going to All-Star Game". MLB.com. Retrieved July 7, 2012. ^ "All-Star Game Final Vote sponsored by freecreditscore.com (#finalvote) now under way; Twitter voting returns to Final Vote Thursday, July 11". MLB.com. July 6, 2013. Retrieved July 27, 2013. ^ a b Footer, Alyson (July 11, 2013). "Freeman, Delabar win record-setting Final Vote". MLB.com. Retrieved July 27, 2013. ^ Jaffe, Jay (July 11, 2013). "Freeman wins NL All-Star Final Vote but Puig's absence a missed opportunity". Sports Illustrated. Archived from the original on July 15, 2013. Retrieved July 27, 2013. ^ "Freeman, Delabar win All-Star Final Vote; Puig finishes second". Sports Illustrated. July 11, 2013. Retrieved July 27, 2013.